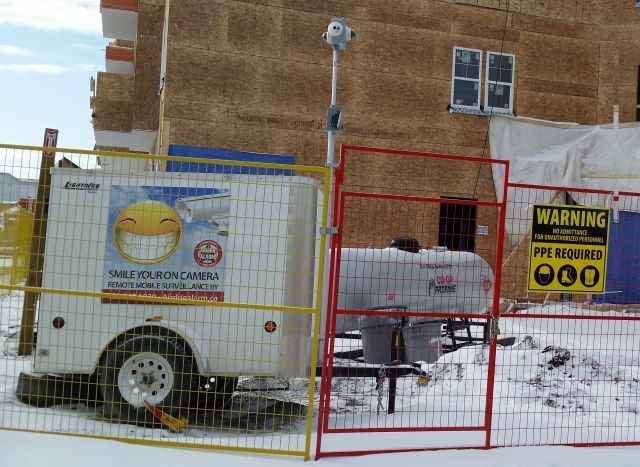 With Airdrie Alarm remote IP security notification system installed, you can view a site or multiple sites from anywhere you are. Not only will this enable the site owner and project managers to micro manage shippments and make decisions without being on site; recorded video can be access to provide video evidence to aid in investigations. Trained Security officers can conduct real-time surveillance tours at scheduled intervals and verify alarms. Surveillance software can assist to dispatch Local Law Enforcement upon receiving notifications and alarms set up through our security alarm systems. Various sensors such as Door Position Switches, IR Motion Sensors and Beams, Glass Breaks, Impact Devices and Smoke/Heat detectors can be integrated in to the security alarm panels to suit all different demands and requirements from its clientele and insurance under writers. This is a great cost effective solution for securing construction sites.